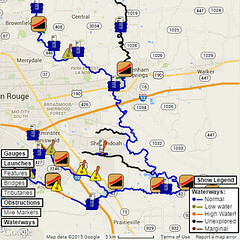 The new PaddleBR Map is up! Here at PaddleBR, we’ve been hard at work all winter. The actual manual labor part of it, maintaining and improving our waterways for paddle access, is probably rather well known at this point. But that’s not all we’ve been up to. Today, as the first part of our “what we did all winter” series… to celebrate meteorological spring, the great Dr. Seuss’s 111th birthday, or just a rather nice Monday (as Mondays go), we’re proud to announce the new PaddleBR Map! We’ve been paddling the waterways around Baton Rouge for quite some time, and with that, we’ve collected more than a smidgen of useful information. Getting it all together into one easy to use system, however, hasn’t ever really been done. We wanted to change that, so now, for the first time ever, we have distilled it all into a Google Maps interface so everyone can know it. And (of course), our first 4.5-miles’ worth of mile marker signs. And the map is even smarter than that. The shallower sections of Bayou Fountain and the Comite River change color when the water’s low enough to possibly slow progress. Sections like the one near Rackley Bridge turn warning-orange when a portage around the bridge is required. Where possible, the obstruction icons fade out when the water level clears them and turn bright when they are again relevant. We’ve tried to get as much of our acquired knowledge onto the map so you can see it all at a glance. We have more improvements coming along. We’ll be collecting more photos and videos to update the launch site pages with much more information and useful tips. We’ll continue to gather more data on obstructions and water levels so more of the map can update itself based on current conditions. We’re also getting ready to explore some more of the black lines to see whether they’re worthy of blue. And, of course, like any good project, we’ll call the map “Beta” for now and welcome any tips, comments, or suggestions you may have. So, there you have it. 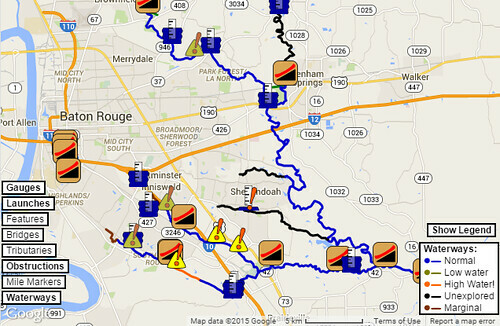 The first real online PaddleBR Map is now live. We hope you like it, and stay tuned for more exciting (perhaps?) developments. More info and locations to add to the map are always welcome, especially on the Amite, which had been mostly unknown to us. Yesterday we went got measurements on the pipeline on Bayou Fountain at Bluebonnet. It’s 8″ in diameter, with the bottom at 6.22′ and the top at 6.88′ on the Bluebonnet gauge. We’re planning to try to get out on the Comite soon to collect data on the depths/sandbars and cascades, too. I have a group together for Bayou Fountain for next weekend. We put in the Amite last summer, from Sims rd area on private property and made a 39 mile camping trip down to the public landing at the end of Carew Harris Rd. Most of the north part of the river was ok, fairly shallow in some places causing us to get out and walk with the canoes. It really got better around Magnolia Beach truck stop. I don’t remember the depth at Denham when we went, but it was in august, and pretty much the average.